Welcome to the November blog by Adina Jewelers! Think you know your gemstones? Test your knowledge of November’s birthstones, citrine and topaz, with our true or false quiz! Scroll down for the answers—but don’t cheat! Citrines are quartz crystals commonly found in igneous, metamorphic, and sedimentary rocks. The common color of citrines is blue and green. 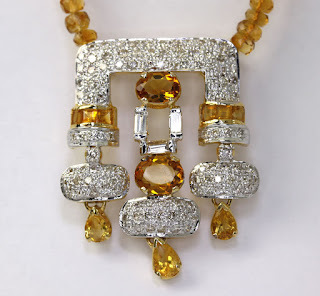 The word citrine is derived from the French word, citrin, which means yellow. Citrine is the gemstone for the zodiac sign of Scorpio, and the gemstone given for the 13th and 17th wedding anniversaries. A gift of citrine is a symbol of flexibility and quick learning. Some believe citrine began as amethyst, the purple quartz, with the heat from molten rock changing it to yellow quartz. When topaz has yellow or green overtones, it is known as Imperial topaz, and can be very rare and expensive. Topaz is known as the “stone of the gods” for its strength. Topaz was believed to ease itchy feet and cravings for sweets. The ancient Greeks believed topaz could make its wearer fly. False. The common color of citrines is yellow and orange. False. The word citrin is a French word which means lemon. False. Citrine given as a gift symbolizes strength and hope. False. When topaz has red or pink overtones, it is known as Imperial topaz. False. Topaz was believed to ease bad tempers, cure insanity, and help insomnia. False. The ancient Greeks believed topaz could make its wearer invisible. The opal is the birthstone for the month of October—the Zodiac sign of Libra—and the 14th wedding anniversary gemstone. Opals also have a rich history dating back to Ethiopia about 4,000 B.C. Whether you were born in October or not, test your knowledge of opals with Adina by Empire Jewelers' True or False quiz! Scroll down for the answers—but don’t cheat! The opal is an ancient mineral known as petrified silica gel that is found deep in the earth’s core where geothermal hot springs once existed. Opals are most commonly white in color, and usually contain a rainbow-like iridescence known as "opalescence” which changes the colors that appear in the stone depending on the angle it is viewed. The word opal is derived from the Latin word "opalus," meaning precious jewel, as well as “upala,” the Sanskrit name for precious stone. Opals are given to celebrate a 14th wedding anniversary, and are a symbol of faithfulness and confidence. In ancient Rome, opals were ground up and consumed because they were believed to be very nutritious. Goober Pedy, Australia is known as “The Opal Capital of the World” because 51 percent of the world’s supply of opals are mined there. In 2008, NASA discovered opal deposits on Mars! Since opal is made up of mostly water, Mars may have contained water for billions of years. False. Opals are found near the earth's surface where geothermal hot springs once existed. False. Precious opals are the most in demand because of their "opalescence” or “play of color.” This is caused by a hydrous silicon dioxide material that causes the gemstone to flash iridescent colors when the opal is viewed from different angles. False. Ancient Romans would grind up and eat opals because they believed they had healing properties and the power to ward off bad dreams. False. The name of the city is actually Coober Pedy, Australia. If you’re looking for opal jewelry, we’ve got an exquisite collection of fine opals necklaces, earrings, rings, pendants and more. Make sure you visit Adina by Empire Jeweler’s extensive online store. You’ll find antique and vintage estate opal jewelry at true wholesale prices. This month’s blog is a celebration of beautiful blue sapphires. Considered one of the most royal gemstones, September’s birthstone is rich in history and lore. Sapphires have appeared in some of the most ornate and beautiful jewelry pieces ever created. Here’s a glimpse at some of the world’s most famous and highly valued sapphire jewelry pieces. The ring has a large oval sapphire—estimated to be between 9 and 12 carats— surrounded by 14 round diamonds set in 18K white gold. The ring cost around $60,000 when it was purchased in 1981, and today has been estimated value between $500,000 and $4 million. Prince William inherited the ring following Princess Diana’s untimely death, and famously presented it to Kate Middleton, Duchess of Cambridge, when he proposed to her in November 2010. Originally from Sri Lanka, The Maria Alexandrovna sapphire was purchased by Alexander II at the London Great Exhibition of 1862, and presented to his wife, Maria Alexandrovna. That is where it gets its name. This sapphire is a 260.37-carat oval with an evenly distributed medium-dark saturated blue color. The sapphire was later set in a brooch consisting of 56.60 carats of smaller diamonds. Discovered in Sri Lanka about 300 years ago and currently on display at the American Museum of Natural History in New York City, the Star of India is about 2 billion years old and weighs 563 carats—about the size of a golf ball—making it the largest gem-quality blue star sapphire in the world. The presence of the mineral rutile gives the gemstone’s appearance a slightly milky quality, as well as the distinctive star effect, known as asterism. Tiny fibers of rutile in a three-fold pattern reflect incoming light in the star pattern. In addition to its great size, the Star of India is unique because it has asterisms on both sides of the gemstone. On October 29, 1964, the world-famous sapphire was stolen from the American Museum of Natural History in New York City. Several months later, the uninsured Star of India was recovered in a locker in a Miami bus station. If you love jewels and ever visit London, be sure to see the Stuart Sapphire, which often goes unnoticed because it is located at the back of the Imperial State Crown. The 104-carat Stuart Sapphire is a fine blue—though flawed—gem. It is oval in shape, about 1½ inches by 1 inch in width, and is set in a gold brooch. The gem is drilled at one end, probably so that it could be worn as a pendant. Dating back to 1214, the Stuart Sapphire was owned by members of the Royal House of Stuart, for whom it was named. Robert II, the first monarch of the Stuart dynasty, was the first to own it, and it was later inherited by James II, who took it with him to France when he was deposed in the Glorious Revolution of 1688-89. James II gave the sapphire to his son James Edward, who passed it on to his son, Charles Edward. Today, it is on display as part of the British Crown Jewels collection at the Tower of London, and is located on the back side of the British Imperial State Crown. If you’re looking for sapphire jewelry, we’ve got an exquisite collection of fine sapphire necklaces, earrings, rings, pendants and more. 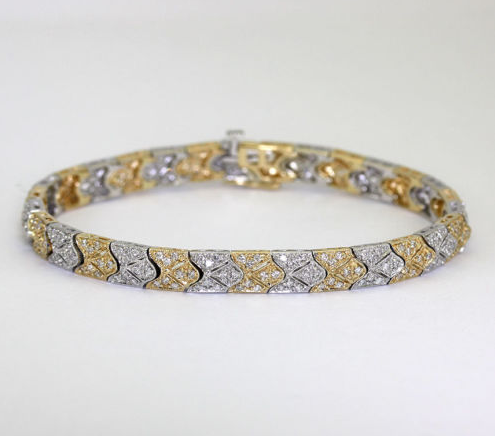 Make sure you visit Adina by Empire Jeweler’s extensive online store. You’ll find antique and vintage estate sapphire jewelry at true wholesale prices. Summer is a great time to scour yard and estate sales for interesting fine jewelry pieces. There are great finds out there, but it’s sometimes difficult to know what you’re looking at if you don’t first arm yourself with some knowledge about jewelry before hitting the sales. Here’s an overview of the definitions and differences between estate, vintage, and antique jewelry. Estate, vintage, and antique jewelry have similar meanings but the differences between them can greatly influence the value of the jewelry pieces. Before you purchase a previously owned piece of jewelry, it’s important to know the differences. Many people consider estate jewelry to be any piece of jewelry that has been passed down from a previous generation, but it actually refers to any piece of jewelry that was previously owned, regardless of its age. Estate jewelry can be broken down into two types: vintage jewelry that is less than 100 years old and antique jewelry that is more than 100 years old. To be considered vintage, jewelry has to be at least 20 to 30 years old, and created between 1910 and 1990. Vintage is probably the most common term of the three, since it encompasses a large collection of jewelry ages. The most commonly collected are vintage pieces from between 1940 and 1970. That includes the glamorous, Hollywood-inspired 1940s jewelry, the fabulous Jackie Kennedy-inspired jewelry of the ‘60s, and even the bold jewelry of the 1980s. Jewelry eras included within vintage include: Modern, Mid-Century Modern, Retro, and Art Deco. Antique jewelry is any piece of jewelry that is at least a century old. So, by definition, all antique jewelry is considered vintage, but not all vintage jewelry is considered antique. When shopping for antique jewelry, beware of the term “antique style,” which is a tip off that the piece is not really antique, but rather made in the style of older, antique jewelry. Anytime the word “style” is used when describing a piece of jewelry it most likely means the item is a reproduction. Many pieces from the 1920's are now considered antique, especially those made in the earlier part of decade. Jewelry eras included in antique jewelry are Art Deco, Edwardian, Belle Eqoque, Art Nouveau, Victorian, and Georgian. It’s important to remember that the use of the terms estate, vintage, and antique can be confusing, and in some cases misleading, so it is very important to understand the differences to avoid accidentally buying a reproduction piece. Why are Mikimoto pearls so popular? Throughout the world, when you hear Mikimoto, you think pearls. What’s the history of Mikimoto pearls? Here’s an explanation, courtesy of thepearlgirls.com. Most jewelry lovers, especially those who are fond of pearls, have heard the name, Mikimoto. Mikimoto Kokichi had a huge impact on the pearl industry. In 1888, he started what many believe to be the first cultured pearl farm in Japan. By 1893, he had his first cultured pearl, and in 1896, he received a patent for producing hemispherical pearls. His patent didn’t really work commercially, so he adopted the "Mise-Nishikawa method” in 1916, and that’s when his cultured pearl business really took off. The cultured pearl industry exploded as well, and by 1935, there were 350 pearl farms in Japan producing 10 million cultured pearls annually. At this point, the natural pearl farmers started to fear the competition. Prior to the early 1900s, the pearl market consisted of natural pearls—pearls created spontaneously by nature. Natural pearls are much rarer and more expensive than cultured pearls, so naturally when Mikimoto entered the scene, offering prettier and more affordable pearls, the natural pearl farmers started losing business. In fact, they sued him! The cultured pearl business also put many pearl divers out of business. At that time, The Persian Gulf was known for its natural pearls, and divers worked consistently to find them. When cultured pearls flooded the market, the demand for natural pearls fell drastically, and many divers and others in the natural pearly industry lost work, and even their livelihoods. The word “cultured” came about to distinguish natural pearls from non-natural pearls. Cultured pearls were considered by some to be less desirable and authentic than natural pearls. So, who has Mikimoto pearls? Many people from the WWII “Greatest Generation.” Following the Second World War, after the Allied Forces occupied Japan, they feared an illegal pearl trade, so pearl sales were discouraged from being sold within Japan. Instead, the Japanese sold pearls in military stores frequented by Allied troops. While Mikimoto pearls aren’t necessarily the best pearls in the world, they can certainly be considered some of the oldest cultured pearls from one of the oldest pearl companies in existence with the greatest name recognition; similar to the Levi’s brand and jeans. Mikimoto Kokichi has earned the distinct honor of being the founder of our modern-day cultured pearls, and will always carry the legacy of almost single-handedly launching the cultured pearl market worldwide. If you’re looking for quality pearls, make sure you visit Adina by Empire Jeweler’s remarkable online store. You’ll find an exquisite selection of estate and vintage pearl jewelry including necklace strands, earrings, pendants and more at true wholesale prices. If you’re lucky enough to own a set of sterling silver flatware, you either want to keep it and use it, or perhaps sell it. A quick look at eBay shows antique sterling silver flatware sets bidding for around $3,000.00! Whether you want to keep or sell your set, it should be clean, shiny, and well organized. Here’s how to properly clean and care for a sterling silver flatware set. Sterling silver, and other metals, including copper, brass, and aluminum, require regular cleaning and tarnish removal. Tarnish is a thin layer of corrosion that forms over time from the metal’s exposure to hydrogen sulfide, normally present in the air. Tarnish can also develop after contact with wool, felt, or certain foods. That electrochemical process is called oxidation. Tarnish usually forms as a dull grey or black coating over the silver. Interestingly, tarnish is self-limiting, which means it only affects the top few layers of the metal. The outer layers of tarnish actually seal and protect the underlying layers, which is why a good cleaning can restore silver to its shiny original state. You want to clean your silver, not damage it. To avoid doing so, use a non-abrasive silver cleaner that requires rinsing after use. Silver cleaners that require rinsing are usually less abrasive, so look for brands that state the cleaner is "non-abrasive." Do not use chemical dips for cleaning sterling silver flatware, as they contain corrosive acids. Also, do not put your sterling silver flatware in the dishwasher. For supplies, you’ll need a plastic dishpan, soft cotton dish towel, cotton balls, non-lemon-scented, phosphate-free hand dishwashing liquid, white vinegar and/or non-abrasive silver cleaner, silver polishing rouge cloth, and a dry artist’s horsehair paintbrush. First, place the flatware in the plastic dishpan. Add a teaspoon of non-lemon-scented, phosphate-free hand dishwashing liquid and fill the pan with warm water. Wash the flatware with a soft dish towel and remove oils, fingerprints, and debris. Rinse the flatware with warm water and dry with the soft cotton towel. Next, clean light tarnish by wiping the area lightly with a cotton ball moistened with white vinegar or non-abrasive cleaner. Dry the flatware with the towel. To remove heavier tarnish, apply a small amount of non-abrasive silver cleaner to a soft cloth and rub the flatware gently from side to side, or up and down. Do not use circular motions, and do not apply an excess amount of cleaner to the silver—use only the amount needed to remove the tarnish. Rinse the cleaner off the flatware, and wipe off any dried cleaner with the towel. To remove residual cleaner from nooks or patterns, use a dry artist's horsehair paintbrush. Rinse the cleaned flatware with warm water and dry with a soft cotton towel. Polish the sterling silver dinnerware with a silver polishing rouge cloth to restore the silver's shine and luster. First, know what it’s worth. You don’t have to know the exact value of the jewelry you are buying, but it’s a good idea to know what your pieces are generally worth. Next, evaluate jewelry of similar quality and composition. Obviously, the better condition the jewelry is in and its grade of gemstones precious metals, the higher its value. If a valuable piece looks too worn, then their still may be value in the stones and metal. Understand how gold is valued. The purity of gold jewelry is indicated by its karat stamp. Most gold jewelry, especially antique pieces, are 14-karat, which means they are only about 58 percent gold. A 24-karat gold piece is pure gold and will be worth approximately the current price of gold per ounce. If there is no karat stamp on the gold piece, it is usually because it’s not real gold. In some instances, the karat stamp may have worn off. A quick way to test if a gold piece is real is to place it next to a magnet; if it sticks, then it’s not real gold. Just as you should know how gold is valued, the same goes for precious gemstones. You’ll need official certification to know exactly how much your gem is worth. If you don’t have certification, research what type it is and its general popularity and market value. Has the piece been appraised? Make sure you are buying from a reputable, established jeweler who has appraised the piece you’re interested in accurately. Make sure the appraiser is Gemological Institute of America (GIA) educated. The GIA is the industry standard for gem and precious metal appraisals. A GIA-educated appraiser should abide by the strictest industry ethics and methods to ensure that a seller is given the fair market price for the piece being sold. The price of gold and silver changes daily based on various factors, including market demand, manufacturing supply, and the financial markets. It’s important to understand that the price of the metals which apply to the piece. Enjoy your estate, vintage or antique jewelry! Most importantly, if it is a piece for yourself, make sure it is something you would enjoy wearing, or if it is for a friend or relative, if it is their taste. Have you seen them wearing pieces like it? The most valuable piece of jewelry is one that will be enjoyed. If you’re in the market for estate, vintage or antique jewelry, make sure to visit Adina by Empire Jeweler’s remarkable online store. You’ll find an exquisite selection of estate rings, earrings, bracelets, watches pendants and more at true wholesale prices, all appraised by Adina Jewelers by Empire’s GIA-educated appraisers. Welcome to the April issue of Adina’s Blog by Empire Jewelers! This month we celebrate April’s birthstone, the diamond, one of the most beloved and desired of all the gemstones. Full of history and intrigue, here are some delicious facts about some of the world’s most famous diamonds. The Graff Pink—the most expensive diamond ever sold at auction. The Graff Pink continues to hold the world record for the most expensive diamond ever sold at auction. The rare pink diamond is rectangular shaped, and weighs 24.78 carats. It is among less than two percent of the world's diamonds categorized as “potentially flawless” because it needs repolishing. The diamond was sold by its previous owner, celebrity jeweler Harry Winston, 60 years ago and has been in a private collection until purchased by Graff. Graff’s buying price of $46 million topped a previous world record for the selling price of a jewel at auction. The “Heart of the Ocean” diamond necklace from Titanic. Who can forget the iconic “Heart of the Ocean” necklace in James Cameron’s loving film tribute, Titanic. While the necklace in the film was fictional, it had a lore all its own. According to the film’s storyline, the large blue diamond was originally owned by King Louis XIV, and was later cut into a heart shape, to resemble the real Hope Diamond. Following the worldwide popularity of Titanic, jewelry company Asprey & Garrard created a real “Heart of the Ocean” made with a 170-carat, heart-shaped sapphire, surrounded by 65 30-carat diamonds. There are many replicas of the “Heart of the Ocean” on the market. Many are made with a cubic zirconia sapphire replacing the blue diamond heart, and Swarovski crystals replacing the surrounding diamonds. 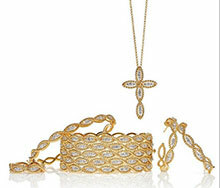 Christie’s Elizabeth Taylor jewelry auction. In December 2011, Christie’s New York held a hugely anticipated auction of the late Elizabeth Taylor’s famed jewelry collection, estimated at $150 million. Taylor’s collection fetched a record-breaking $115 million at auction, including $8.8 million for the Taylor-Burton diamond ring given to her by Richard Burton. Taylor wore the 33.19 carat rectangular-cut diamond to many events, including Princess Grace’s 40th birthday party in Monaco. Taylor sold the diamond in 1978 following her divorce from Burton to fund her charity work. Thomas W. Burstein of Christie's said the only time the ring left Taylor's hand was when she offered it to friends to try on. The diamond ring was bought by a private buyer from Asia for $8,818,500. What Marilyn wore to the Gentleman Prefer Blondes movie premier. Recall the indelible image of Marilyn Monroe singing “Diamonds Are a Girl’s Best Friend,” dressed in a pink satin evening gown with matching gloves, surrounded by well-dressed men, and diamonds dripping from her neck and wrists? The centerpiece of her outfit was the Moon of Baroda diamond necklace, which she wore to the Gentlemen Prefer Blondes movie premier. The Moon of Baroda is a stunning pear-shaped, yellow canary diamond that weighed 25.95 carats when it was found. It was later cut into its current pear shape and weighs 24.04 carats. For more than 500 years, it was owned by the Maharajas of Baroda, India. In 1787, it was sent to the Empress Maria Thérèse of Austria and was also was worn by Marie Antoinette in the 18th century. It was later stolen by Afghan tribal leader Nadir Shah in 1739, and then returned to Baroda where it remained for almost 200 years. In 1943, it was purchased by Meyer Rosenbaum, who lent it to Monroe for Gentlemen Prefer Blondes. In 1991, the diamond was auctioned and sold at Christie's, New York and is now in a private collection. Princess Diana’s diamond and sapphire engagement ring. Following Prince Charles’ proposal to Lady Diana Spencer on February 24, 1981, she chose a gemstone ring from a Garrard catalog, rather than having a diamond ring custom made for her, which was the royal custom. Following her death, Prince William inherited the ring, and he famously presented it to Kate Middleton, Duchess of Cambridge, when he asked her to marry him on November 16, 2010. The ring has an 18-carat, oval sapphire surrounded by 14 round diamonds set in 18K white gold. The ring cost around $60,000 when it was purchased in 1981, and today has been estimated between $500,000 and $4 million. If you’re in the market for diamond jewelry, make sure to visit Adina by Empire Jeweler’s remarkable online store. You’ll find an exquisite selection of diamond rings, earrings, bracelets, pendants and more at true wholesale prices, all appraised by Adina Jewelers by Empire’s GIA-educated appraisers. In this month’s blog, we examine luxury watches, specifically Rolexes. Here’s what to know and think about before buying one, according to clockmaker.com. 1. Be honest—can you afford it? Before actually buying a Rolex, the most important thing is to be honest with yourself if you can afford it. Will the watch be an asset or a liability? Do some research: there are various versions of Rolexes out there, with an official, brand new Rolex being the most expensive. Are you willing to buy new? Does it have to be 100% authentic? Assess you financial situation carefully and honestly, and choose your watch accordingly. 2. Make sure the dealer is legit. Even a pre-owned Rolex is an expensive item. 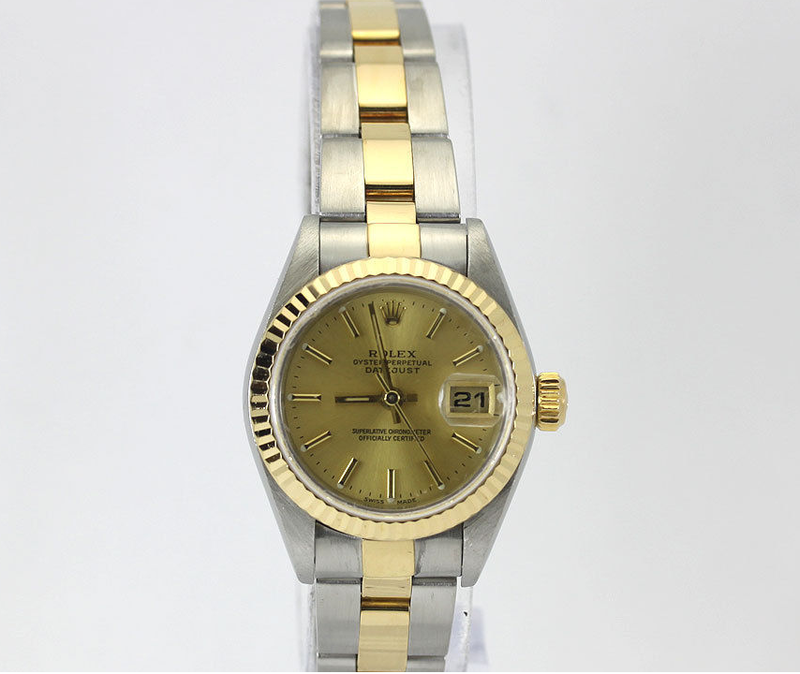 It is absolutely essential that you buy your Rolex from a knowledgeable dealer, a dealer you know you can trust. Every year, people are scammed out of millions of dollars thinking they are buying “the real thing,” when in fact it’s a cheap knock off. That is why it is important to buy a new or used Rolex watch from a knowledgeable and reputable dealer, preferably in a brick and mortar store you can visit in person. A new Rolex can be purchased from an authorized Rolex dealer or it can be obtained from an independent, unauthorized watch dealer selling new, near-new, pre-owned, or vintage Rolex watches. If your objective is to purchase a new, current model Rolex and to save on the price, or if you are looking for a specific model no longer available from an authorized dealer, then buying from an independent watch dealer is probably your best option. To find an authorized Rolex dealer in your area, visit rolex.com for dealers in your area. 3. Make sure it’s a real Rolex. In the past, fake Rolex watches were so poorly made that it was usually easy to distinguish the fake from the genuine item. Today, counterfeit Rolexes can be almost impossible to distinguish from the world-renowned Swiss masterpiece. Online auction houses and individual Internet sellers commonly offer very convincing copies. If you want a genuine Rolex, make it clear to the dealer that you are interested in seeing and buying only a 100% genuine, unaltered Rolex watch—including the watch band. Do you offer an unconditional money back guarantee that the watch is a completely genuine, authentic, unaltered Swiss made Rolex? Will you also off an unconditional guarantee that the bracelet does not contain any non-Rolex parts? 4. Confirm that it’s in good working order. Before you buy, make sure the watch is working properly, and has been serviced by an authorized Rolex service center, or reputable and experienced independent watchmaker known to specialize in high-end watches. Do you offer a full, written, timekeeping and water resistance guarantee with your watch for one full year? 5. Get the model and serial number. Make sure you get and check the model and serial number of the Rolex before buying. The dealer should give you the opportunity to take the bracelet off and check the numbers located between the lugs. The serial number is usually located next to the “6 O’clock” point of the dial and can tell you the approximate age of the watch. The reference number is located next to the “12 O’clock” point of the dial and is engraved with the phrase “ORIGINAL ROLEX DESIGN” and a 4-5 digit number under it. This number must match the model. Note that some better fakes may have serial numbers, but they are generally acid etched in and not engraved. If the watch does have a serial number but it looks poorly engraved or barely etched then do not buy it! In 2005, Rolex started engraving the case’s serial number in the inside edge of the case at the “6 O’clock” position, under the crystal and below the bezel. 6. Take your time deciding. Whether you are buying a new or pre-owned Rolex, choose carefully and don’t allow yourself to be rushed into buying. Do your research, and if necessary, ask the dealer to hold the watch for you for a day or two while you consider buying it. Trust your instinct: if the deal sounds too good to be true, then it probably is. Make sure you are 100% satisfied with the watch and the purchase—this is an heirloom item that should last your lifetime and be handed down to the next generation. Finally, once you buy, insure it and enjoy it! With the new year upon us, we thought it would be a good time to review some gemstones basics, starting with one of the most beloved of all gems, the diamond. Diamonds are crystals made of pure carbon, and are the only gemstone composed of just one element. Small amounts of other elements might be in diamonds as impurities, and often give diamond its color variation. Diamonds are formed under crushing pressures and intense heat, mostly in the Earth’s mantle and delivered to the surface by deep-source volcanic eruptions. These eruptions produce the kimberlite and lamproite pipes that are sought after by diamond prospectors. Diamonds have a hardness of 10 on the Mohs Scale. For millennia, diamonds have been thought to be the hardest material in nature. But in 2009, a composite material containing the mineral wurtzite boron nitride (w-BN) was shown to have the same resistance to indentation as diamond. In fact, research in China and the U.S. suggests that pure w-BN is significantly harder than diamond. About 2,500 years ago, diamonds were first discovered in India. While the U.S. is the largest consumer of diamonds, there is barely any production here. The only mine is a state park called the Crater of Diamonds State Park in Arkansas where tourists can pay a fee to look for diamonds. The park yields just a few hundred carats per year. Color: Most diamonds run from colorless to near-colorless, with slight hints of yellow or brown. “Color” is not how much color a diamond has, but the degree to which it is colorless. The GIA set the industry standard with its D-Z scale (D is colorless while Z means the diamond has the most yellow.) The exception to this rule are fancy colored diamonds which aren’t included in the GIA’s D-Z scale. Colors beyond the Z color are considered fancy colored diamonds. Clarity: Most diamonds have tiny crystals, feathers, or clouds within them, called “inclusions.” Surface imperfections are called “blemishes.” The rarest diamonds are flawless and have no internal inclusions or external blemishes. The GIA uses a Clarity Scale of 11 grades that are measured using 10X magnifications. Carat: Signifies the weight—not the size—of the diamond. One carat is equal to 200 milligrams. Since heavier diamonds are rarer than smaller diamonds, the value is higher the heavier the carat weight. Cut: The cut of a diamond refers to its proportions, symmetry, and polish. When evaluating cut, two aspects are assessed: shape (round, marquise, square cut, etc. ), and how well the cutting was executed. It must be geometrically precise, since it will affect a diamond’s fire (the flash of rainbow colors from within) and brilliance (its sparkle). The cut was historically the most subjective and difficult to standardize during appraisal, but due to advances in technology, the GIA introduced its cut grading system in 2005. Not all diamonds fall into the typical white-yellow-brown color range. They can be pink, blue, purple, red, orange, or any color. Colored diamonds, known as authentic fancy colored diamonds, get their color from the trace elements they are exposed to. For example, radiation can create a greenish tint, while large amounts of nitrogen causes a yellowish color. Real natural fancy colored diamonds are very rare and expensive, but through irradiation and heat treating, gemologists are able to enhance the color of most natural diamonds. Fancy colored diamonds are found in 12 different colors, with more than 90 secondary hues and nine intensity levels within the 234 color combinations. Fancy colored diamonds are graded a bit differently than white diamonds. The four main criteria for determining a fancy colored diamond’s value are hue, color saturation, color purity, and availability. The more rare a diamond is in color, the more valuable it will be. If the color is richer or saturated, the diamond will also be worth more. And like a white diamond, a colored diamond’s clarity or purity of the color will also increase its value. Also, inclusions can be desirable. Inclusions are actually flaws, but in a colored diamond, they can create unique tones and beautiful flashes of color. People have been able to manufacture diamonds since the 1950s. These are known as synthetic diamonds. Today, more than 100 tons of diamonds are manufactured every year. Most of these diamonds are used to make cutting tools and abrasives. Synthetic diamonds are often undistinguishable from naturally occurring diamonds, but they can be identified by laboratory tests. For diamonds not in a metal setting, gently clean the diamond with a solution of ammonia and water. For diamonds in metal settings, soak the piece in a solution of warm water and mild detergent for two to five minutes. Gently scrub the diamond with a soft toothbrush or jewelry brush. Then, rinse the diamond in warm water to remove remaining detergent. Buff the diamond dry with your cloth. 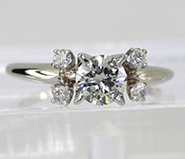 Whether you’re getting engaged or just looking to buy beautiful, quality diamond jewelry, Adina by Empire Jewelers has a magnificent collection of estate and vintage diamond jewelry, available at true wholesale prices, as well as a wide variety of precious and semi-precious gemstone and gold jewelry. Shop online today, and remember, if you have any questions, please don’t hesitate to contact us.